The symbol of the modern Olympics is five interlaced rings, which represent the union of the five continents. Judge, wrestling is bringing together many many countries into a sport that is valuable and popular. 1) "It is difficult to understand the logic of abolishing an Olympic sport that dates back to the ancient Greeks. Wrestling is arguably the trademark of competition at the Olympics. There is no justification for doing away with it as a core sport that has over 200 countries sending athletes to participate. If wrestling was good enough for Plato to participate in and Homer to write about, then every effort should be made to examine how to improve the sport to ensure it continues as part of the Olympic tradition," says Assemblyman Chris J. Brown. 2) "Wrestling is one of the sports of the original Greek Olympic Games and in the first modern Olympic Games.," says Rich Bender, executive director of USA Wrestling. 1. 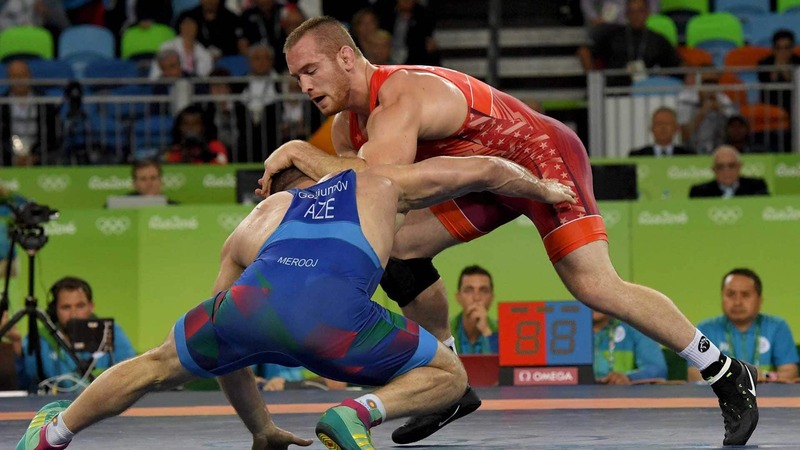 Wrestling popularity in Olympic Games has dropped drastically. According to IOC documents obtained by the Associated Press, wrestling ranked "low" in several of the technical criteria, including popularity with the public at the London Games -- just below 5 on a scale of 10. Wrestling sold only 100,851 tickets in London out of 116,854 available. Wrestling also ranked "low" in global TV audience with a maximum of 58.5 million viewers and an average of 23 million, the documents show. Internet hits and press coverage were also ranked as low. Previous Olympic Games have also seen lower viewership and popularity. This is sourced from ESPN article, IOC Drops Wrestling from 2020 Olympics. According to a study done by the New York Times, Olympic wrestling popularity has in fact gone down with each passing Olympic Games. The Sydney 2000 Games saw 73.5 million viewers, the Athens 2004 Games 64 million, the Beijing 2008 Games 60.5 million. Ticket sales for wrestling matches also decreased drastically with each Olympic Games. Judge, what we're seeing here is a progressive decline in viewership and popularity of wrestling in the Olympic Games, which shows the world's decreasing interest in wrestling. This is sourced from New York Times article, Decreasing Popularity of Wrestling. 2. Of all the sports in the Olympics, wrestling causes the most injuries. Because wrestling is the sport with the most amount of physical contact, there are significantly more injuries. Evidence: According to data from the Center for Injury Research and Policy, equestrian eventing and wrestling are the two Olympic sports that have the highest risk of serious injury to athletes. Study participants consisted of 343 wrestlers participating in the 2008 Beijing Olympic Games. Standard checkoff forms were used to collect the injury data, including injury type, severity, location, timing, and mechanism. A total of 343 wrestlers sustained 84 injuries during 406 matches, which is equivalent to an overall incidence of 19.30 injuries per 100 athletes and 7.88 injuries per 100 matches. Among the 3 styles, freestyle had the highest injury rate (22.1%) and female wrestling the lowest (12.5%). This is sourced from NCBI article, Wrestling Injuries During the 2008 Beijing Olympics. 3. Wrestling in the Olympics is poorly managed compared to other sports. One of the reasons why the International Olympic Committee dropped wrestling from the 2020 Olympic Games was because the FILA, or the international wrestling federation, has no athletes on its decision-making bodies, no women's commission, no ethics rules for technical officials and no medical official on its executive board. These four things are required by the IOC. None of these IOC requirements were a secret. FILA knew these were requirements, and yet they did nothing about it. IOC member Sergei Bubka says, There are certain significant arguments because as of today there's no commission for athletes, no administration for decisions of the federation's executive committee, there's no women's committee.There are no rules regarding sanctions for the federation's ethical norms. There are simply statistical data that [breaches] happened. In fact, when Bill Scherr, a former American wrestler who won a bronze medal in the 1988 Olympics, told FILA that wrestling might be in trouble after talking to a few IOC members, his warnings were not heeded. No petitioning was done, and no sufficient representation was acquired. Instead, FILA just assumed that wrestling's status as an ancient Olympic sport would protect them. They did nothing to support the merits of the sport and did not even try to save it. FILA has antiquated leadership. Clearly, wrestling needs advocates; FILA isn't doing the job. This is sourced from New York Times article, Wrestling's Olympic Exit Due to Poor Management. Olympic sport - sport approved by the Executive Committee of the International Olympic Committee (IOC) for inclusion in Olympic Games held every four years. 1. Wrestling is a unique sport that anyone can participate in, and therefore we should keep it as an Olympic sport because it brings together different people with different backgrounds from around the world. Because wrestlers participate based on their weight, anyone can participate and be evenly matched. There have been so many Olympic wrestlers with different backgrounds who are all able to participate. For example, Steve Fraser, a deputy sheriff from Ann Arbor, Michigan, was the first American to ever win a medal in Greco-Roman wrestling. He won a gold medal in the 1984 Los Angeles Olympics. Also, Clarissa Chun, a 4 feet 11 inches tall kindergarten teacher from Honolulu defeated a seven-time national champion in the U.S. trials in 2008. This petite, half-Japanese, half-Chinese woman was able to go onto the 2012 London Olympics and win a bronze medal. Because anyone can participate in wrestling, it a universal sport that many countries participate in. Afghanistan, Austria, Belgium, Bolivia, Cambodia, Cameroon, Macedonia, Mongolia, and so many other countries have competed in Olympic wrestling. Athletes from Finland and Sweden have won 167 Olympic wrestling medals. 2. Wrestling teaches children important life lessons and helps them become fit. Many Olympic wrestlers teach children the lessons of perseverance, following your dreams, and not giving up. They teach children that they can do anything if they try hard. For example, Rulon Gardner, the Olympic wrestler who weighed 475 pounds, qualified for the 2004 Olympics again after a motorcycle crash, after dislocating a wrist in a pick-up basketball game and after a snowmobile misadventure led to a case of frostbite and the loss of a toe. Another example is Henry Cejudo. Cejudo was the youngest of six children, born to undocumented Mexican immigrants. He was raised in a fatherless environment and lived in some of the poorest neighborhoods in Los Angeles, Las Cruces and Phoenix. He slept on the floor with the rest of his siblings. Sometimes he had to skip a meal. Yet, he practiced and worked on his wrestling skills endlessly, and in the 2008 Beijing Olympics, he became the youngest American to win a gold medal. I was able to learn a lot of life lessons including hard work, dedication, discipline, sacrifice, and teamwork through wrestling. I was involved in one of the top programs in the country, and decided when I was in highschool that I wanted to be both a teacher and a coach to give back all I had learned,â€ states Travis Gary, a 32 year old high school wrestling coach who wrestled in the Olympics. 3. Wrestling is viewed by many people and is profitable. 180 countries wrestle, and wrestlers from 71 countries went to London last summer; before they could compete, they had to win some of the toughest qualifying tournaments in the world. Wrestling scores well on universality: athletes from 71 countries competed last year in London. It requires little - some would say too little - kit, making it more accessible than most other pursuits. And, unlike softball, tennis, or golf (which will reappear in Rio de Janeiro in 2016 after a 112-year absence from the games), it has stuck faithfully by Pierre de Coubertin's amateur ideal. As important, an Olympic gold is to a wrestler the apogee of sporting achievement.